Did you think that if you've escaped alive from Russian revelry and merry-making, criss-crossed the Trans-Siberian railway, or outdanced a Chechen in a lezginka contest, you've attained the peak of travel enlightenment with nothing more to aspire to? Think again. We're going to check what you're really capable of. The boundless Russian soil offers you the chance to take part in a cutlet festival, compete in throwing a... no, wait, you need to be prepared. So let’s get on. Below is a list of 7 festivals that regularly take place in Russia. Decide if you think you could survive such a “holiday”. The Koryaks, one of the indigenous ethnic groups of Kamchatka, celebrate Khololo (hopefully the renowned vocalist Eduard Khil, a.k.a. Mr. Trololo, springs to mind) at the end of the summer fishing season. According to Koryak beliefs, the celebration appeases the souls of seals they have slain, so that the following year they bring their mates for the slaughter to continue. Guests are offered traditional meat and fish dishes, songs are sung, ancient rites are performed, and there's even tambourine playing. The finale of the celebration is a native-style disco. The story of Turgenev's Mumu is known to every Russian schoolkid. It tells the tale of the mute serf Gerasim, who drowns a dog called Mumu in a river on the orders of a tyrannical noblewoman. Not a barrel of laughs (anyone for an Hachiko festival?) Residents of Oryol decided to right the wrong done to Mumu, and perhaps burnish Turgenev's reputation in the process. In addition to literary readings and musical items, the festival features a "noble" costumed canine parade, demonstrations by police dog handlers, and a publicity event by the "Cat and Dog" animal group to find loving homes for stray dogs. Who said soccer's not a game for women? On the Kola peninsula they think differently. While men catch fish with a soda can and compete in lassoing a stuffed deer stuck in the ground, women in traditional sundresses do battle in 5-a-side footie. Whereas in normal soccer the goalkeeper can smother the ball with his body, in Saami football the goalie uses the hem of her skirt. A Saami football is sewn from reindeer skin and stuffed with deer fur or pieces of buckskin. Let's fight the impending autumn blues with... cow dung! This obscenely simple and fun sport has taken the Perm region by storm. Local resident Vladimir Zverev snooped the idea for the contest from like-minded souls in Oklahoma, home of the World Cow Chip Throwing Contest, no less. He who throws furthest, wins. It's now the main local festival, attracting turd throwers from all over the Perm region. Participants get so elbow deep in the action that they don't even wear gloves. The festival has become so popular that in 2010 its status was raised to international level, with the support of the US-based Beaver County Chamber of Commerce, organizer of the above-mentioned cow chip throw. Incidentally, this year's winner hurled a dried organic projectile a distance of 46.5 meters. Challenge accepted? The Perm region is not short of enterprising souls. 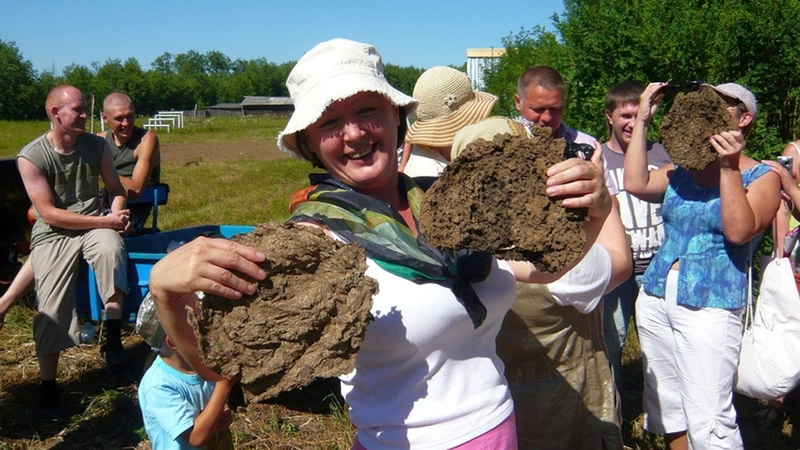 A month after Merry Manure, Perm natives rush headlong into a new adventure – celebrating Russian mosquitoes in the locality of Usolye. This year's competition for the title of "sweetest girl" was won by 9-year-old Irina Ilyukhina, who counted 43 mosquito bites; the girl received them while picking berries in the forest with her mother. Other titles up for grabs were "skinniest legs" ("mosquito legs" competition) and "most beautiful voice" ("mosquito buzz" competition). Sadly, another folk pastime – mosquito hunting (where participants try to fill jars with as many insects as possible) – had to be postponed this year because of the heat. Hopefully, next year it will go ahead as planned. Gastronomic festivals are a dime a dozen. If it’s a day off in Russia, you can bet they’ll be celebrating cucumbers in Lukovitsy, tomatoes in Minusinsk, or onions in Lukh... You could make a Greek salad by visiting them all, and get a whiff of the diversity of Russian agribusiness. Some like it hot, and for those who do, we recommend the nettle festival, devoted to this rather unpleasant weed that irritates the skin. Rich in vitamins, the nettle was once a staple of Russian peasant dishes. It rescued people during the lean war years, and saved Gulag prisoners from scurvy. When processed, nettles do not sting and form the basis of plenty of recipes around the world. The nettle festival, held annually at the initiative of the Leo Tolstoy Museum Estate of Yasnaya Polyana, lets you try nettle pizza, nettle lasagne, nettle beer, and even a nettle smoothie. And to whet the appetite, you can give yourself and a friend a nettle flogging, according to an ancient remedy. Festivals are meant to be fun, right? Nonsense. Saratov has come up with a festival for those who like to sit languidly on the windowsill with a cup of cocoa, pondering the falling rain. Since 2004, a procession of "sufferers" from across the globe have been drawn to Saratov, host city of the "Saratov Sufferings" international film festival of documentary melodrama. The festival organizers are flying in movie directors Kira Muratova and Krzysztof Zanussi, so joking aside, the festival will be worth the attention of any cinephile. It turns out that "suffering" is the name of an age-old Saratov musical genre, so it’s not actually about promoting melancholy and despair.